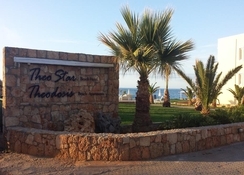 Theodosis Apartments are situated directly at the long sandy beach of Malia. In the lively resort, there are numerous shops, bars, restaurants and entertainment possibilities to be found. A mini market for daily needs is just 100m away, and a taverna, 30 m. The studios and apartments at the hotel are equipped with kitchenette with extractor fan, 2 cooking rings, small oven, refrigerator and kettle, safe and air-conditioning at extra charge, shower/WC and balcony or terrace.The hotel also has billiards and a fresh water swimming pool to relax. The hotel is only 4 km from the Kasteli International Airport.